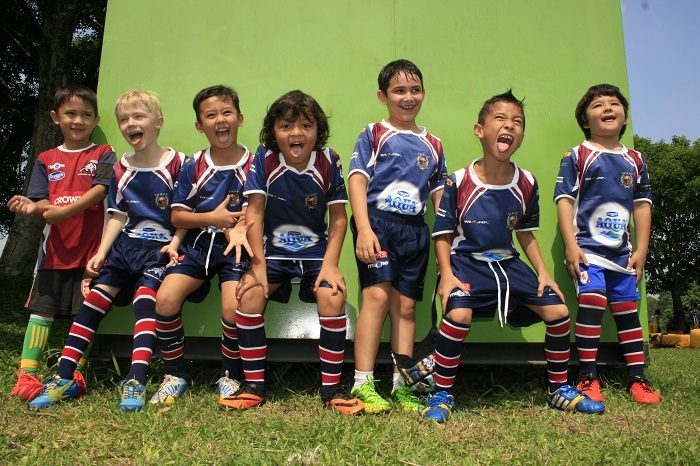 Pound for pound, the combined Under 8s/Under 7s mixed (both boys and girls) team pack the biggest punch in the Jakarta Komodos Rugby Football Club, with raw ability and boundless energy more than making up for the lower skill sets and fuller understanding of the intricacies of the great game of rugby. This is the perfect group for children ranging in age from 6 to 8 to be introduced to the sport, and the strict no-tackle policy allows for a primary focus on fitness, running with the ball, handling skills and the invaluable introduction to being part of a team, the club and the wider rugby community. Saturday training sessions typically comprise an hour of drills and a 30-minute game among the players where they can put what they have learned into action in what are entertaining matches enjoyed by both players and parents. The season is marked by a number of competitive matches at tournaments in Jakarta, a provincial tour to Bali as well as overseas tours to Singapore and Thailand. Though these matches are generally considered to be Under 7s, 8-year-olds can be granted dispensation to play on the team, with consideration given to experience, size and ability. There is only one rule – having a good time.